After spending hundreds of hours on the forum and sending a ton of PM’s its my turn to try and help someone out. The truck is my DD 97 T100. With the 3” body lift Ball joint spacers and AAL in the rear on 35s I was destroying CV shafts like crazy and bent 2 idler arms. After breaking or bending something on every trip I decided it was time to start gathering parts. A huge thanks goes out to Zac at Rustys Off Road and also Josh at Inchworm Gear. Once you deal with companies like those its hard to call anywhere else. Since both Cv’s were blown, the idler arm was bent, and the control arm bushings were frozen allowing for no caster adjustment I took out the plasma cutter and went to town. The front diff with 4.56 gears and aussie locker is still available for sale. It works great and has never given me a problem. After an hour fri night I had the front cut off and was ready to start grinding. Saturday a few buddies of mine stopped over to help out. Since the plasma cutter is 20 years old and I never used it before, I left a lot of over hang from what was cut off. The upper control arm mounts are also a part of the motor mount. I did not want to leave them open so I cut them as flush as I could with a sawzall and made some caps from some 3/16” scrap. I never really saw any rear shackle mounts/setups so I decided to try my own way. I used a piece of 3/16” plate steel about 9” long 5” wide to make the base for the rear shackle mount. 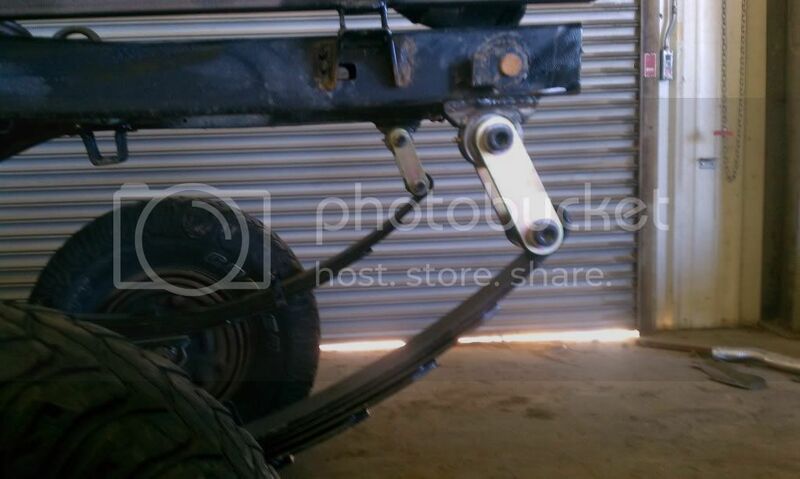 The rear mount is a Trail-Gear (from inchworm gear) shackle mount and the gussets were from rustys off road. mass huh? part of any clubs down that way? Im up in northern vt but wheel all over. Full cage, 3 link and full width build up here!! i just joined northeast toyota crawlers, i also have a small group of 12 that wheel with us every other week during the summer. i can Pm you a schedule as soon as we line the dates up. I pushed the front hanger as far forward as I could and after double checking everything was straight tacked everything in place. I couldn’t wait any longer and wanted to see a little flex. Set the truck on its own weight and went up with one lift arm under the axle. I stopped before it got to close to the lift incase it slid off. I used the pre-made 14” travel shock hoops from Inch worm Gear and Rustys Off Road Rx 300 remote reservoir shocks in the front. After a whole weekend of nonstop work the front end was done and ready for paint. Imho the truck is way too tall for 35s. my plan is to remove the body lift and let the front settle before doing any suspension changes. It rides down the road awesome and has way less body roll then the ifs did. It handles the normal bumps a lot better as well. I did have a problem on my first road trip. 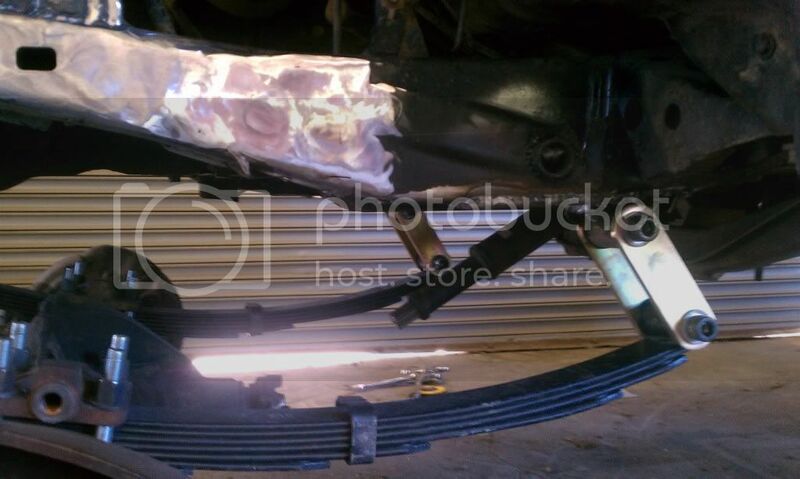 The front leaf springs had a lot of play in the hanger and caused a serious death wobble. I made some small spacers a little wider then a washer for each side of the leaf spring bushings. This took up 98% of the play and stopped the death wobble. I am still waiting on a front drive shaft but took some poser shots in my back yard. The T100s, non tacoma trucks, and older 4runners actually had a real frame compared to the tin can the tacomas have for a frame. There is no need for frame plates. I drink everclear for the flavor. i had ordered the set from trail gear but they did not line up very well. i am going to make my own soon. once i finish my rear bumper. I ordered my front driveshaft from Tom Woods, he asked a few questions and shipped it out quick. I swear he started building it when we were talking on the phone, and finished it before we hung up. I Sas's mine in 2007, still need to frame plate mine, and add under engine cross-member . Last edited by Jomentum; 02-20-2012 at 09:24 PM. Thats where i called for mine. i used the print out sheet they had on-line for the measurements. Did you do any changes to the axel for caster and camber or pinion angle? I am the toe cutter!Have you seen the night rider! 01 Tundra Stonewell Body ready for shoeing! Last edited by hotshoe; 03-21-2012 at 01:58 PM. thanks. i have not done much to the truck since i swapped it because racing started. i did use 6* shims but i think the caster is still wrong. i ordered 4" shackles from inchworm to drop the height and they should be in monday. from there i will work on the caster and see if i have to turn the knuckles. the camber is also off, the tires lean \-----/ pretty bad. i read about off set ball joints and may try those. I'm about to have to start thinking about this too, I'm running 5" shackles right now and my pinion is almost flat with the trucks weight on it. I was thinging 6* shimswould prob get it just about right. Cool, I wanna get it set right before I start messing with the drive shafts. I'm running TG 5" springs front/rear and I'm thinking I will be removing some leaves to drop it some, I'm sure they will settle some. i put on the 4" shackles i had josh at inchworm gear make and i am very happy with how it sits. it fixed my caster problem and realized the camber problem was actually the toe of the tires. with the caster so far back the tires looked \----/ but with the correct caster the toe was way off. tires were facing away from each other. i no longer get a wobble and it steers alot better. it also handles the bumps better. this is how it sat with the 5" shackles, the front was about 1 3/4" higher then the rear. Looks good, glad that fixed your problem. Mine sits level right now, but I'm not running a bed out back yet, so no weight. I put the TG 5" shackles on Tuesday and they are way better then the one I made. Finally ordered and installed a front drive shaft from Tom Woods. They made it and shipped it not even 24 hrs after i placed the order. Took her out for a test run and need some help with the steering. With the hubs locked in and the t case in 2wd i cant turn at all. ( it is locked in the front). I also need to fool with the rear suspension more. Love the truck!! I have a 95 T100 Reg cab and was thinking bout changing the suspension in the front. How much you got into this project approx just on the front end?? Thank you. I did the project over time. I just waited until i got good deals and had extra cash. Its really not horrible if you space it. If you want a complete list of parts prices and where i got everything from PM me and i can write a list out. since the t100 is now a trailer queen I have been doing a lot of local fair mud bogs and small rock crawl courses. The rear does not droop enough and the frame behind the gas tank is junk so instead of wasting time and money on leafs and fixing the frame i want to chop it behind the cab and 4 link it. Would the trail gear 4 link rear kit make a good starting base or should i start from scrap and make it all my own?. Little progress on the 4 link. Took a long time but it's finally ready for its first run this weekend. I've finished my swap in my 1998 T100 as well with exception of the front driveline. How did you end up setting your front driveline up? My angles aren't the best and trying to figure out the best way to do a driveline with out forking out $1000 plus.